‘Mission accomplished’ was what we both heard as we took off from Nairobi Jomo Kenyatta airport on Sunday Feb 26th 2017. 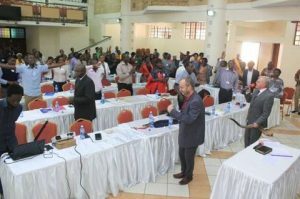 Both Mike Pike and I were not particularly looking forward to the 28 hour journey home from Kenya to our homes in Cornwall, England but that was nothing to endure compared to the joy of seeing the one hundred plus Kenyan strategic leaders joyfully embracing the message we had brought from the Lord that this was the time and season for the Bride of Kenya to awaken and prepare Herself for the coming of the Bridegroom King. Then to join together in crying out in one heart and soul….Come Lord Jesus Come! 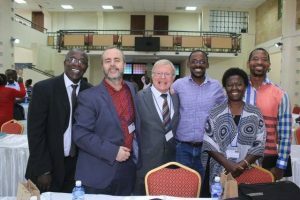 God’s hand was clearly upon this conference right from the initial introductory meeting we had had with the ‘gatekeepers’ of the nation of Kenya several months earlier. 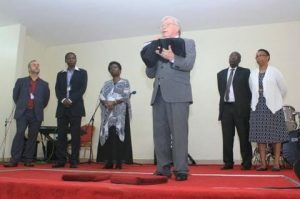 It was held at a hotel in the city of Nairobi called Hadasseh (Esther’s Jewish name – Esther was the interceding Bride) chosen quite arbitrarily and this as well as their final choice of venue for the conference in a church hall in the city called McBride’s Hall demonstrated the Lords affirmation for the plans made. 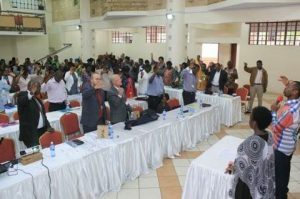 So it was that this Network called the Intercessors for Kenya had asked us to bring the message of the Bride – our true and end time identity to a conference of key leaders from the Church of Kenya. 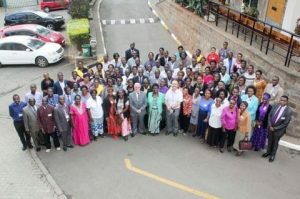 We met together with the delegates who had come to Nairobi for the conference from many regions of Kenya and several other nations, under the leadership of intercessor Rev Phoebe Mugo and her team. 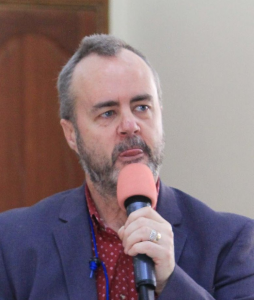 We gathered together at 8.30 am each morning for two and a half days, from Thursday 23rd to 25th February sharing the revelations that God so graciously had downloaded to Mike and myself over the past few years about the Bride of Christ and their centrality to God purposes for today. We began the conference by laying a scriptural rationale for the bride being the central theme of the bible and set that against 1) Gods eternal purpose for His creation and 2) the history of the mortal Church. We wanted to show how God moves in times and seasons and we encouraged everyone to see how important it was to understand the times and season that we were living in presently, in order for them to arrive at the understanding that we had entered the Season of the Bride and the One New Man. Now was the time to ‘make ourselves ready’ for the coming of the Bridegroom King and because God in His grace had restored the fivefold ministry and the Holy Spirits Baptism of Power back to the Church, we could now become mature and without ‘spot or blemish’. Mike gave us wonderful insights into the journey that the Bride must make as she prepares herself and that will include often a wilderness experience of testing just as Jesus himself was tested. The Bride is like the moon is to the sun. Her glory is a mere reflection of His but she can only reflect Him as She positions Herself in alignment with Him. She must experience too those things that He endured. She must become more and more intimate with Her lover, Her Bridegroom as this is always the key. Howard’s task was to lay the foundations of Understanding the Times and Seasons and share about the necessity for unity, for there is only one Bride. Jesus does not have a harem. Both shared about the various woman in the bible who give us types of the Bride both in terms of character and function. Mike painted a picture of the Glorious Bride…..A wonderful session. Howard then charged the Church/Bride to ‘Come out of Babylon’ showing how like the Jews of old we the Church had been in Babylon too long and had compromised the Kingdom of God trading it for another. Leaving our worldly (Babylonian) ambitions behind and laying down our worldly methods and schemes, we are challenged to go on a journey ‘towards Jerusalem’, to rebuild the city as it were. This city is the Body of Christ, the Church Bride and a reflection of that city which one day will be seen “coming down out of heaven dressed like a Bride”. 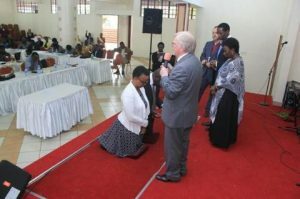 At one point in the Conference we had the joy of commissioning Benson Nyamgor, one of the Network Leaders and his dear wife, for ministry to the Body. It was a great privilege. 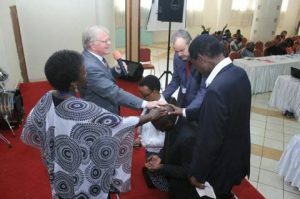 At another time we had the great privilege of praying for all the Pastors who were attending the Conference. 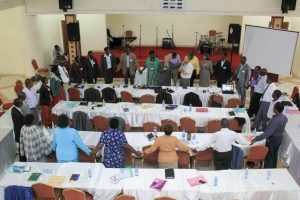 It was wonderful to witness how on the last day, the Holy Spirit brought the conference to the place of readiness when we could call Come Lord Jesus!…. a cry that only the Bride can cry, for it is “the Spirit and the Bride” alone that can cry Come! We were crying out to the Holy Spirit both to Come and make us ready, and to others to drink of the waters of life ….to those who are thirsty ….and to the Lord Jesus to Come for us …His precious Bride. In fact we had come to understand that in the very act of crying Come we were receiving the anointing necessary to ‘Make us ready’ and were shifting our position and aligning ourselves with the heart of the Father.. We were indeed beginning to get dressed and Jesus was beginning to be ‘released from heaven’ to collect His Bride and to take Her to the Wedding of the Lamb. What a joyful response from all the delegates at the conference. What a cry of “Come” rang out quite spontaneously with shouts of faith and prophetic declarations voiced into the spiritual realm. The worship band picked up the rhythm and the beat of the drums could be heard inviting us all to march to the words Come Lord Jesus! The Warrior Bride was standing up….standing up in Kenya and She was beginning to march and cry as one. Gently the sound of “Come Lord Jesus! Come Lord Jesus! Come! Come! Come! was being sung all over the auditorium. It was like a mighty army. It grew in sound and rhythm. Some were swinging their arm in time to the drum beat, the march and the song. But God the Father and the Son it seems was also singing over us, the Songs of the Bridegroom as the Bride was singing the Songs of the Bride. IT WAS AWESOME! And so….having hoped for and dreamed about the whole conference assembly crying Come, we saw it happening. The Call2Come had happened! And it happened first in Kenya. The next day we were invited to preach at City Revival Centre, Nairobi and we both shared a Word after which in the afternoon we spoke to the ladies meeting and ministered in prayer to them. God moved in much power and healed, anointed and empowered many. There was such an impartation of His Spirit. The air was thick with His presence. This is a strategic Church and we are looking forward to working more closely with them. Then in the late afternoon we went into the centre of Nairobi to Government House and the clock tower that stands beside it and like we were privileged to do beneath Big Ben, the famous clock in London Westminster some months earlier, and which is the clock that regulates the time around the world, we blew the shofar and declared that this was the Season of the Bride for Kenya. It was a powerful moment. Outside these building were some large trees that had had some of its branches cut off and yet was sprouting new life. The ground beneath the tree around the protruding roots was red like blood and it was what Mike had seen in a mind picture previously. Kenya is a well-watered garden and new life within her boundaries was sprouting. The blood shed upon Her soil in times past which even now cried out to the Lord, was being cleansed by the shed blood of Jesus. Mike made a cross of some wood he found as he had seen in his vision and laid it beneath the tree on the red soil as we prayed and prophesied and blew the shofar. It was another special moment! Its very powerful,impartable and wanderful.May the Almighty God blesse both of you.